Senior Rieley Hanner Gets a Big Pin! The Smyrna Bulldogs came into the Fire Pit at Blackman on Senior Night for the final dual meet of the regular season. Smyrna has been impressive this year as they have wins over fellow district 10 foes, Stewarts Creek, LaVergne, Riverdale and Siegel. Blackman Seniors who were recognized are Daniel Bradford, Manager – Alleigh Bryant, Manager – Jessica Garrison, Rieley Hanner, Ryan Heath, and Jamil Hughes. The Blaze program will surely miss this group of seniors! The Bulldogs carry a big stick and they are scrappy and spirited. In the first match at 195, Blaze senior Rieley Hanner was able to secure a pin over Smyrna’s Zachary Alford. That opening momentum was huge and the Blaze took advantage. At 195, Ryan Heath scored an 18 second pin. Smyrna forfeited 220 and 285. 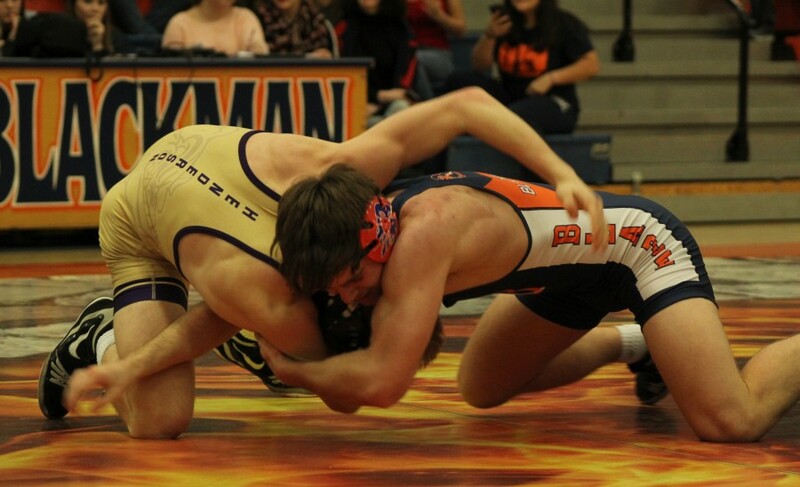 The Blackman lightweights kept things moving as Alex Rose, Peyton Adams, and Jeremiah Savage all got pins. Smyrna forfeited 126. At 132, Shawn Wolford scored a pin as well. The matchup of the night was Senior Daniel Bradford taking on Smyrna’s Cameron Henderson. The two wrestled earlier in the season with Henderson winning the first meeting. In an exciting match, Bradford secured the first takedown and scored a few points, but Henderson stormed back for a couple of takedowns of his own and ended up with the lead. 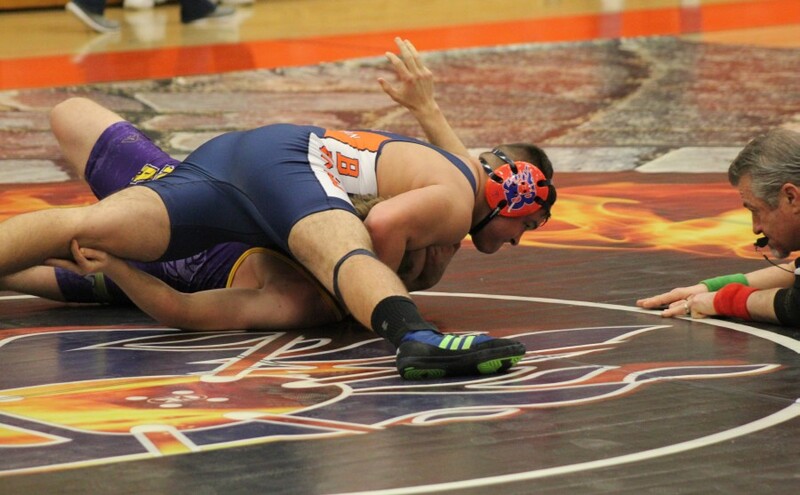 Bradford earned a 1 point escape with short time left and the match went to overtime. In the overtime period, the two got into a scramble and Bradford came out on top for the win! Smyrna won the next match by fall over Blaze backup Aaron Fisher. That would be the only scoring for the Bulldogs on the night. Blackman won the final three bouts. Jalen Brown won a major decision over Daniel Derryberry, Brooks Sacharczyk got a crazy “stand him on his head” pin over Lopez and Landon Fowler scored a first period pin in a very aggressive match with Smyrna’s Caleb Brimm. 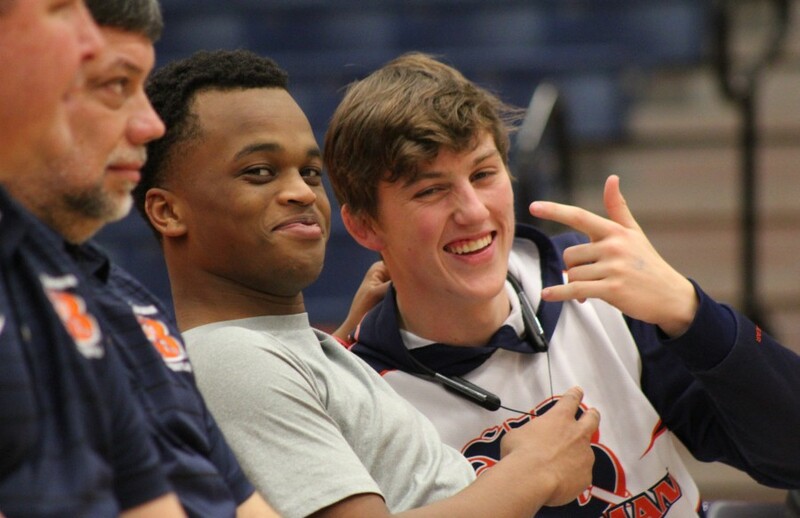 The Blaze will be back in action on Thursday at the Region 5 Duals in Tullahoma.